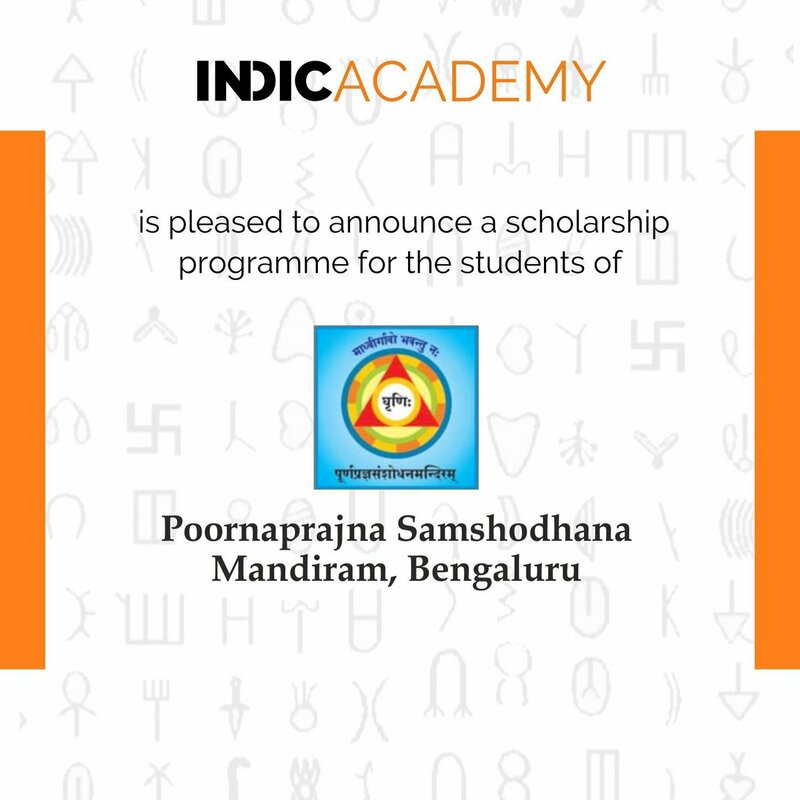 Indic Academy is happy to announce scholarship support for courses, internships, workshops & seminars to the research scholars & students at Poorna Prajna Samshodhana Mandiram, Bengaluru. Poornaprajna Samshodhana Mandiram (PPSM), a pioneering Sanskrit research institute started in 1990 was an initiative of Sri Vishveshateertha Sripadaru. He founded two large institutions dedicated towards Indic studies in Bangalore. First Swamiji established the Poornaprajna Vidyapeetha Sanskrit Pathashala in 1956 and then the Research center came as a companion institute. The Vidyapeetha is a residential school that provides education to students from primary to post-graduation, with food, shelter, and education being provided free to all students. The Sanskrit Pathashala is recognized as post graduation study center and affiliated to the Karnataka Sanskrit University Bengaluru and caters to close to 500 students at the present. Whereas PPSM Research Center at the Vidyapeetha was established for higher research in Indian Philosophy in General and Dwaitha Philosophy in particular. The Human Resource Development (HRD) Ministry of the Government of India recognized the PPSM as a model research institute, and included it in the prestigious group of the Rashtriya Sanskrit Sansthan (Deemed University) in 1994. The Ministry also sanctioned financial assistance of 95% by way of a grant through the Rashtriya Sanskrit Sansthan. Many students have received their Ph.D. degrees from Rashtriya Sanskrit Sansthan, New Delhi, through the PPSM centre. 15 books brought out in Kannada language, with the financial assistance of H.H. Sri Vishveshatirtha Swamiji and His devotees. 35 Seminars organized on different subjects like Artha Shastra, Rajaneeti etc. 10 Workshops conducted on Dinakari, Viveka-chudamani, Vedantaparibhasha etc. 31 scholars were awarded Vidyavaridhi (Ph.D.) through our institution by Rashtriya Sanskrit Sansthan, New Dehi. 12,000 ISCI pages data of Dvaita Vedanta texts has been submitted to the Sansk-net project of RSVP Tirupati. 3 senior most scholars of philosophy served as fellows in Shastra Cudamani scheme.